The term ‘ethnic cleansing’ fuelled fierce debate during the 1990’s when it was applied to atrocities being committed in Bosnia and Herzegovina. The euphemism for genocide was coined by perpetrators and adopted by journalists and politicians, penetrating official language. The definition of ‘ethnic cleansing’ remains a scrutinised topic. Defined by intent, genocide is a punishable crime that signifies mass murder while the term ‘ethnic cleansing’ remains undefined and denotes a lesser degree of harm. Blum et al. believe the term ‘ethnic cleansing’ “corrupts observation, interpretation, [and] ethical judgement”. 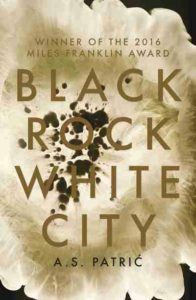 Black Rock White City follows poet Jovan and his wife Suzana, exiles of Sarajevo, as they struggle to find purpose in their life in suburban Melbourne. They survive in a displaced reality, in an emotionless afterlife punctuated by a war that claimed the lives of their two children. The displaced poetry of Jovan’s past emerges when he is forced to remove cryptic messages embedded in graffiti from the bayside hospital where he is employed as a cleaner. As Dr. Graffito’s destructive acts become increasingly violent, Jovan is forced to confront the trauma of his past. 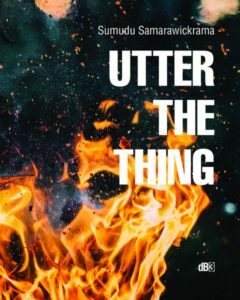 Set in a hospital, the novel comprises an arrangement of euphemistic expressions, exhibiting the obscurity of figurative language to convey distinct meaning. The title, born from Melbourne suburb Black Rock and Belgrade’s literal translation to White City, takes the form of equivocation. The title’s contrasting colours, black and white, indicate a clear distinction between right and wrong doing—evil and virtue. Patric’s discourse leaves no rock unturned and solicits with bone chilling intelligence an examination of ethical judgement and decision making; an agenda intended for a distinct recognition between the terms ‘ethnic cleansing’ and genocide. The destruction begins with a message, The / Trojan / Flea, written on the hospital X-Ray screen. Accumulating throughout the narrative is an assemblage of visual implements analogous to seeing and not seeing which stimulates an effect of clarity or obscurity. Words are engraved into optometry lenses, eye charts are altered with messages of graffiti, blurred reflections viewed through glass. The X-Ray screen acts as an object of awareness, prompting closer observation of the term ‘ethnic cleansing’ in relation to genocide. Reference to the Trojan can be seen as a parable to the subterfuge the Greeks used to win the Trojan war, conveying by comparison the implications of the term ‘ethnic cleansing’ which as a result of judicial interpretation excused perpetrators of war from legal consequence for atrocities which would otherwise be punishable in international law under the crime of genocide—by default making the perpetrators victorious. “Fleas on the Trojan Horse. Who knows what he actually meant?” (230). “Flea” is one of many words that comprise examples of word ambiguity. In this instance the character’s own interpretation offers an example of how meaning can evolve from common acceptance of a term, similarly in the way ‘ethnic cleansing’ and genocide are interpreted generically albeit far removed in meaning. Later in the narrative, Jovan comes upon stencil markings of dead bodies on the hospital floor and Dr. Graffito’s titled message “ethical cleansing”(200). Patric’s word evolution from ‘ethnic’ to ‘ethical’ supports an review of justice in relation to perpetrators of war and the ethical responsibility for genocide. Patric’s main characters, Jovan and Suzana, exist without expression, rejecting language and communication in their struggle to survive displacement. In the afterlife of war, words written and spoken are as mute as the unspeakable deaths of their children, “Their names were Dejan and Ana. And there’s nothing more that can be said about the dead that doesn’t make them small, lost and forgotten” (51). The significance of rejecting words denies the term ‘ethnic cleansing’ as a euphemism to communicate acts of genocide. In contrast to the characters rejection of words, Patric has focused on communicating the senses both in content and form, with acute awareness of sight, sound, and language expression. Patric punctuates expressions to emphasise force of meaning, “A finger tapping him on the chest any time Jovan looked as if he might rise from his seat. Not as a threat, as punctuation for the story Mitrovich was telling…” (203). Punctuation too, is expressed by representation of exact words in their basic sense, which works to disambiguate meaning, “’A question for you,’ Jovan says loudly, placing a full stop into the doctor’s mouth” (44). This literal language—in contrast to symbolic marks of punctuation—is in a sense, another way of demonstrating the disambiguation of meaning. Patric’s literal translation of punctuation is seamlessly executed at the close of Chapter Two when the spotlight of focus is on the hospital Optometrist waiting at the station for a train. “There has been a notion on many such occasions. It has always been a small idea barely the size of a full stop in whatever she was reading. She’s read that famous book by Tolstoy and remembers the images of a flame being blown out and a book being closed. But it’s not as easy as that. Or poetic. It is more like a pig hung from its rear legs and getting its throat cut. It is a mutilation the splintering bones of her skeleton had never prepared for. It is a demolition of her soul her imagination could never have conceived. There is no book to close. There is no candle. Such absurdly poetic images for the pages of a story. The scene at Hallam station ignites the senses. The shock of Miss Richards leap is a visceral sensation that plunges the reader into a punctuated vertical drop; the leap acting as a terminal line of exclamation above the “full stop”. Patric’s discourse is both figurative and literal and offers a collision of realities. The trauma of Miss Richards body hitting the rails and the impact of the train emphasises clarity and aids any uncertainty of meaning: In a sense the reader confronts the trauma head-on. The impact of pain and coming apart is contrast to a flickering image of death analogous to the scene from Anna Karenina, that expresses a metaphorical image that fails to convey the reality of death. The significance highlights the obscurity of figurative language to convey distinct meaning. The narrative juxtaposes Jovan’s poetry and messages of graffiti to emphasise the disparity between forms of expression and interpreted meaning. The poetry of Jovan’s past dislodges as it collides with the messages embedded in the graffiti, forcing Jovan to relive scenes from the war on Bosnia. Jovan’s recollections derive from actual news broadcasts of NATO’s air strikes on Belgrade in 1999. Patric’s use of discourse from real events imposes reflection and perspective, enforcing a way of understanding yet being far removed in experience from the reality of war; it’s a way of necessitating rememberance of events so the memory does not forget. The medical community and Jovan’s occupation as hospital janitor in this novel are details that spotlight attention on the delusion that ‘ethnic cleansing’ is as a measure for public health, the cleansing of a society or race, a euphemism that Blum et al. believe “bleaches the atrocities of genocide” (204). Dr. Graffito’s destructive acts turn to obliteration when a woman is found inside the hospital drowned in a bleach bath, and what emerges will leave no reader in two minds of this novels intent. Black Rock White City takes issue with war, examining the ethics of justice and crime in the case of Bosnia. It explores immigrant displacement and refugee experience, interrogating the nature of language to reveal how interpretive meaning can trivialise the realities and atrocities of war, impeding justice. Blum, Rony, et al. “‘Ethnic Cleansing’ Bleaches the Atrocities of Genocide †.” European Journal of Public Health 18.2: 204-09. Print. Singleterry, Douglas. “”Ethnic Cleansing” and Genocidal Intent: A Failure of Judicial Interpretation?” Genocide Studies and Prevention 5.1 (2010): 39-67. Print. Sirkin, Micol. “Expanding the Crime of Genocide to Include Ethnic Cleansing: A Return to Established Principles in Light of Contemporary Interpretations.” Seattle University Law Review 33.2: 489-526. Print. NICOLE THOMAS lives on the South Coast of NSW. She holds a Bachelor of Creative Arts with Distinction from the University of Wollongong, and was awarded The UoW Centre for Canadian Australian Studies (CCAS) Award. Nicole is currently working on her memoir.